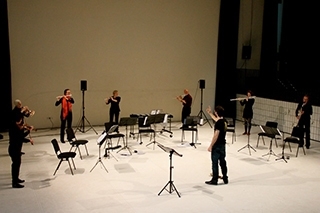 KNM Campus Ensemble is an amateur ensemble set up by the professional, Berlin based KNM Ensemble. It is an associate ensemble of CoMA with a relationship that started in Summer 2015 when the Musical Director, Rebecca Lenton (who plays flute in the main KNM Ensemble) was a tutor at the CoMA Summer School. In March 2016 we travelled to perform at King’s Place, London in the Festival of Contemporary Music for All. In October 2016,we hosted KNM Campus Days our first festival in Berlin, with workshops over two days and performances by KNM Campus Ensemble, CoMA Allcomers (from the UK) and CoMA Maastricht. We all joined together to perform Into pieces by Hannah Kendall. For more information about the ensemble see our own web site (mainly in German).